This week was marked by the annual gathering of rich folk at Davos, an event much lauded by the mainstream media. An host of journalists comes to Switzerland, prowling for soundbites and arranging live broadcasts to TV channels all over around the world. Petroleum prices remaining one of the biggest economy stories of the day, the Davos gathering produced an unusual amount of eminent opinions. In all, this made for the most depressive week I can recall for the petroleum market. The collective thinking of the pundits at Davos seems to indicate that petroleum is soon to become dirt cheap and the industry about to disappear. If the energy soundbites coming out of Davos mirror the thinking of rich folk, then being or becoming rich has little to do with intelligence. 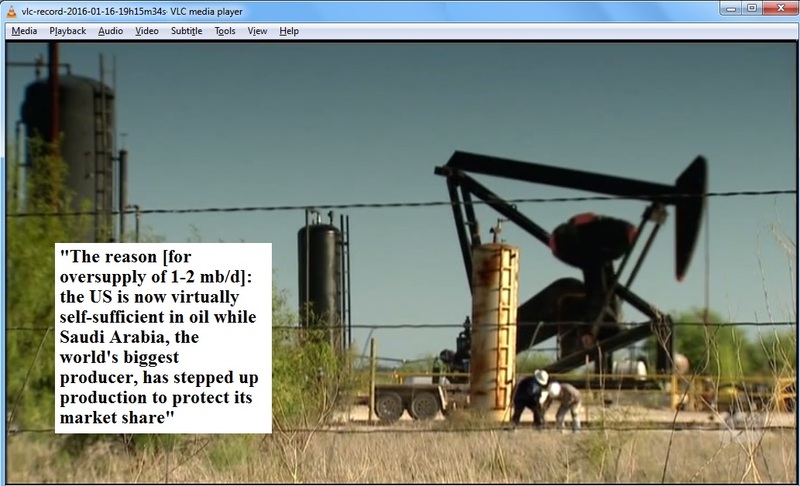 Petroleum will not flow to the marketplace if there is not an able industry extracting and marketing it. And this industry (being it private or national) can not fare at this day and age with 30 $/b. The greatest mistake of mainstream thinking is expecting the market to always find some sort of stability. The most recent public data on world petroleum extraction points to an inversion towards decline late last summer. There are however some regions with growth potential, even in the present market. An obvious case is Iran, that regained full access to international markets after the lifting of international sanctions over its Nuclear programme. The lifting of sanctions on Iran on Saturday marks a new era in bilateral relations between Tehran and Washington, one of the country’s vice-presidents has said, adding that further rapprochement is contingent on how the US goes about fulfilling its commitments under last summer’s nuclear accord. In an interview with the Guardian, Masoumeh Ebtekar warned against what she said were new attempts in the region to create a sense of “Iranophobia”, though she did not single out by name Tehran’s regional rival, Saudi Arabia. Ebtekar, a close ally of President Hassan Rouhani, hailed the removal of sanctions as “a success of diplomacy and negotiation” and said it was a very strong indication that with the necessary will “we can resolve many of the outstanding international conflicts, without resorting to force and violence”. Ron Patterson provides useful and detailed data showing how OPEC members fared in recent times. Saudi Arabia and Iraq together increased the output of the cartel by almost 1 Mb/d in 2015. Even with Iran now a full market player, such increase is likely unrepeatable any time soon. The OPEC Monthly Oil Market Report is out. OPEC took a hit in December, down 205,000 barrels per day. After examining the past and present production numbers, I believe that OPEC, except Iran, has peaked. That is, the combined production from all the other OPEC nations, has peaked. And any additional production from Libya is likely to be in tiny increments that won’t make much difference in the big picture. Other OPEC nations may show a slight increase from their current level. But the combined production from all the other 11 OPEC nations, 12 if you count Indonesia, has peaked. Of course there will be some small increases from the other 11 OPEC countries from time to time but overall, in 2016 and beyond, I believe OPEC production will go from flat to down, with a greater chance of it going down. That is we are at, or near, the peak right now. There might be a slight uptick of their combined production in the coming months but not enough to get excited about. But in general the present petroleum price is by and large crippling the petroleum industry. The much advertised Brasilian pre-salt plays are now officially shut in until betters days. Much of the deep-water plays in the world are in for similar faith. Energy analysts Wood MacKenzie said last week that low oil prices have now caused the delay of 68 planned petroleum projects globally. Representing $380 billion in frozen capital expenditures. And news late last week shows it’s not just the private sector shutting things down in oil development. Governments are also now looking to hold off on developing their in-ground reserves at low prices. Led by oil powerhouse Brazil, which said Friday that it will discontinue offering new offshore projects in one of its most prospective regions. That’s the deepwater pre-salt play. A target that over the last several years has yielded some of the biggest multi-billion barrel finds seen anywhere in the world. But Brazil’s President Dilma Rousseff told a press gathering Friday that there will be no more new exploration in the pre-salt for the foreseeable future. Saying that the government will hold off auctioning new blocks in the play for the “short-term”. “No one holds an auction for an exploration block with the barrel below $30 unless you want to give it to someone,” Rousseff was quoted as saying by local press. Even in Nigeria, home to some of the best quality petroleum resources in the world, the present petroleum price is forcing a rethink of the extraction programme. Petroleum extraction in Nigeria peaked about a decade and could be now meet a period of accelerated decline. The price of oil, now in the neighborhood of $30 per barrel, is getting close to its production cost in Nigeria and soon may lead to the shutdown of some of the country’s oil fields, according to some energy executives and financial institutions. The Central Bank of Nigeria’s latest figures show that the price of Nigeria’s crude, Bonny Light, has dropped to $29.47 per barrel. And several financial services companies, including Bank of America, Merrill Lynch, City Group, Goldman Sachs and Morgan Stanley say it could drop further to $20 per barrel.One oil executive, Alhaji Abdullahi Bukar, told the Nigerian newspaper Punch that the current price isn’t much more than it costs to extract the oil. Interesting notes on the demise of the so called "shale oil" industry that was supposed to revolutionise the US. It seems that now even bankruptcy processes are going in trouble. [...] Bankruptcies are accelerating. Magnum Hunter Resources Corp., Swift Energy Co. and New Gulf Resources filed in December. With more liquidations hitting the market, bargain hunters may not be willing to pay top dollar when there are so many deals to be found. The next test will be the auction of Quicksilver Resources Inc.’s properties, scheduled for Wednesday. The shale driller declared bankruptcy in March with more than $2 billion in debt. And here is one of the aspects of the present petroleum market the mainstream media is not willing to tackle: the growing volume of condensates composing the liquids extracted in the US. The decreasing quality of the fossil liquids extracted from the crust becomes ever more evident. Is the oil glut just about oil? [...] Refiners are already complaining that so-called "blended crudes" contain too much lease condensate, and they are seeking out better crudes straight from the wellhead. Brown has dubbed all of this the great condensate con. An important aspect of the war Daesh is waging in the Middle East. Petroleum at 30 $/b comes at the wrong moment in this regard for the Iraqi government. The raging wars in North Africa and the Middle East regularly reported in this space continue to mingle with, drive and feed off fossil fuels. In the case of Yemen, it will be interesting to see how long can Saudi Arabia support a war that it is not winning. Saudi Arabia launched airstrikes on targets in Yemen on Thursday, killing nine people and destroying trucks that deliver petroleum products for domestic consumption. The strikes hit the Ras Isa port, Yemen’s main oil export terminal. But the terminal has not exported any oil since Saudi Arabia started a war nearly a year ago to fight Houthi rebels. Separately, ISIS militants once again attacked key oil infrastructure in Libya. The Ras Lanuf port on the Mediterranean Coast, one of Libya’s largest oil export terminals, was the target of yet another attack by ISIS this week. Earlier this month, ISIS attacked and set fire to seven oil storage tanks at the port. Early reports say that the latest attacks have also resulted in huge plumes of black smoke emanating from the port. ISIS also targeted oil pipelines that travel from the Amal oilfield to the port of Es Sider, which is located near Ras Lanuf. ISIS, at this point, does not have the manpower to take over large swathes of territory in Libya in the same way that it has done in Iraq and Syria. But the group is hoping to sow chaos in Libya and prevent the rival government factions from establishing control in the country. Daesh is visibly expanding its activity in Libya, focusing on petroleum assets and infrastructure, as reported in previous reviews. There is now some speculation on the movement of Daesh soldiers from the Middle East to Lybia, that could explain the recent rise in activity. January 2016 saw an acceleration of the movement of ISIS fighters out of Syria and into Libya. There were profound reasons for this “flight to safety” by ISIS, in seeking a new haven as pressures in-creased on its territorial holdings in Iraq and Syria, but there were also significant ramifications for Lib-ya, its neighbors, and for sub-Saharan insurgencies, particularly in Nigeria. ISIS sees in Libya the opportunity to seize oilfields in Cyrenaica, in Libya’s east, to compensate for the loss of control it has experienced over captured Syrian and Iraqi oil supplies, which had been chan-neled by tanker trucks through Turkey for sale on the international market. Russian air strikes and pub-licity over the ISIS oil supply line to Turkey — and to Bilal Erdo?an, the son of the Turkish President — have severely inhibited ISIS’ revenues and strategic viability. There is justifiable speculation as to the extent of support for ISIS’ moves to strengthen its base in Lib-ya from the Turkish intelligence service, Milli Istihbarat Teskilati (MIT), but there is little doubt that MIT had been assisting ISIS (and its foundational groups), both in Syria and Iraq, as well as in Libya and elsewhere for several years. Turkey has come under increasing pressure to limit its visible ISIS linkage closer to home, largely as a result of Russian — and to a lesser extent Western — military depreda-tions of the ISIS force, and Russia’s strong exposure of the links which ISIS has had with the Turkish leadership and MIT. Last week the US mainstream media was all alight after the detention of a dozen of naval service men that strayed into Iranian waters. The following article presents an interesting alternative theory on what may have happened. While I am not so inclined to believe Iran has the capability to "take control" over American unmanned vehicles, the disruption of GPS signal(s) seems a plausible hypothesis. The airwaves in the United States were filled with images of sailors on their knees while a US Navy vessel was searched. Unjustified outrage swept the nation. The US Secretary of Defense blamed the incident on a simple navigation error, however a chain of events leading back to 2009 demonstrates the facts are a little more complicated than first appear. The chain of events leads defense analysts to one unmistakable conclusion: Iran has the ability to disrupt US GPS systems. For western military analysts, the thought is terrifying. The West uses GPS for much more than replacing a compass and a map. In 2009, Lockheed Martin’s RQ-170 Sentinel showed up on a runway in Kandahar, Afghanistan. The aircraft entered service two years earlier, but the public was unaware. The bat wing styled drone is reminiscent of the Stealth Bomber. The similarities extend beyond the cosmetic, and the RQ-170 is the premier spy drone in the US fleet. This was the drone used to map out Bin Laden’s compound. It was tasked with keeping an eye on Iran’s nuclear program. That’s when things got interesting. They probably shouldn’t have been so quick to laugh. It appears the Iranians didn’t just down the aircraft, they took control of it mid-flight. Another story that has remained pretty much off the radar. A lone article in a mainstream outlet points the way to what may well become one of the most important resource stories of 2016. It is not a big business: lithium accounts for only about 5% of the materials in some car batteries, and for less than 10% of their cost. Worldwide sales of lithium salts are only about $1 billion a year. But the element is a vital component of batteries that power everything from cars to smartphones, laptops and power tools. 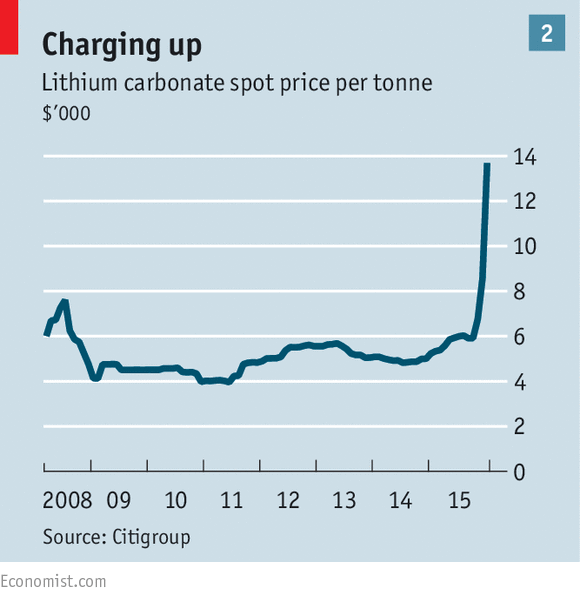 With demand for such high-density energy storage set to surge as vehicles become greener and electricity becomes cleaner, Goldman Sachs, an investment bank, calls lithium “the new gasoline”. SQM is part of a global scramble to secure supplies of lithium by the world’s largest battery producers, and by end-users such as carmakers. That has made it the world’s hottest commodity. The price of 99%-pure lithium carbonate imported to China more than doubled in the two months to the end of December, to $13,000 a tonne (see chart 2). The peak of world goal extraction was again in the news this week. As usual, I prefer to stress the hypothesis of a similar drop in silver extraction, a metal, that like lithium, is far more relevant in the modern economy. Gold has been one of the commodities hit by the worst environment for mining in more than a decade. The price has declined more than 40 per cent from its 2011 peak, to a level where many gold miners struggle to recoup the costs of extraction. This review has been reporting the growing drive towards Nuclear energy primed by the US Energy Secretary. This time it is not just a letter of intentions, real money is being assigned to research projects. In support of the Administration’s goal to produce more carbon-free energy, the U.S. Department of Energy (DOE) announced the selection of two companies, X-energy and Southern Company, to further develop advanced nuclear reactor designs. These awards, with a multi-year cost share of up to $80 million for both companies, will support work to address key technical challenges to the design, construction, and operation of next generation nuclear reactors. Regular readers probably identify a certain degree of positivism in this review. The apocalyptic message many times associated with resource depletion does not echo here. However, from positivism to wishful thinking goes a long way. Can we afford the energy demands of “the fourth industrial revolution”? Don’t ask. The fourth industrial revolution will enable firms to extend the use-cycle of assets and resources, increase their utilization and create cascades that recover and repurpose materials and energy for further uses, lowering emissions and resource loads in the process. In this revolutionary new industrial system, carbon dioxide turns from a greenhouse pollutant into an asset, and the economics of carbon capture and storage move from being cost as well as pollution sinks to becoming profitable carbon-capture and use-production facilities. If you’re not content to take that on faith, then this book may not be for you. Closing with a technology related note. There has been little public discussion on the "problem" created by the European Court of Justice regarding the indiscriminate transfer of personal data to the US and practical consequences are right around the corner. Expect the unexpected throughout next week. The top US and European trade groups have warned their leaders of enormous fallout for businesses and customers if the two sides fail to reach a new deal on data transfers by end January. The European Court of Justice in October ruled that the EU-US "Safe Harbour" arrangement allowing firms to transfer European citizens' personal information to the United States was "invalid" because it did not properly protect the data from spy agencies. EU and US officials have held several rounds of talks for a new arrangement with European officials hoping for a new deal by the end of January, and the four business groups mentioning a "deadline" of January 31, 2016.